29 Oct 1918 Bohemia and Moravia handed over to Czechoslovak authorities. 1 Jan 1919 Slovakia under Czechoslovak authorities. 8 May 1919 Ruthenia joins the Czechoslovak Republic. 1 Oct 1938 - 8 May 1945 Sudentenland annexed by Germany. 2 Oct 1938 Těšín (Teschen) ceded to Poland. 22 Nov 1938 Czecho-Slovak Republic. 14 Mar 1939 Secession of Slovakia. 15 Mar 1939 - 8 May 1945 Occupied by Germany. 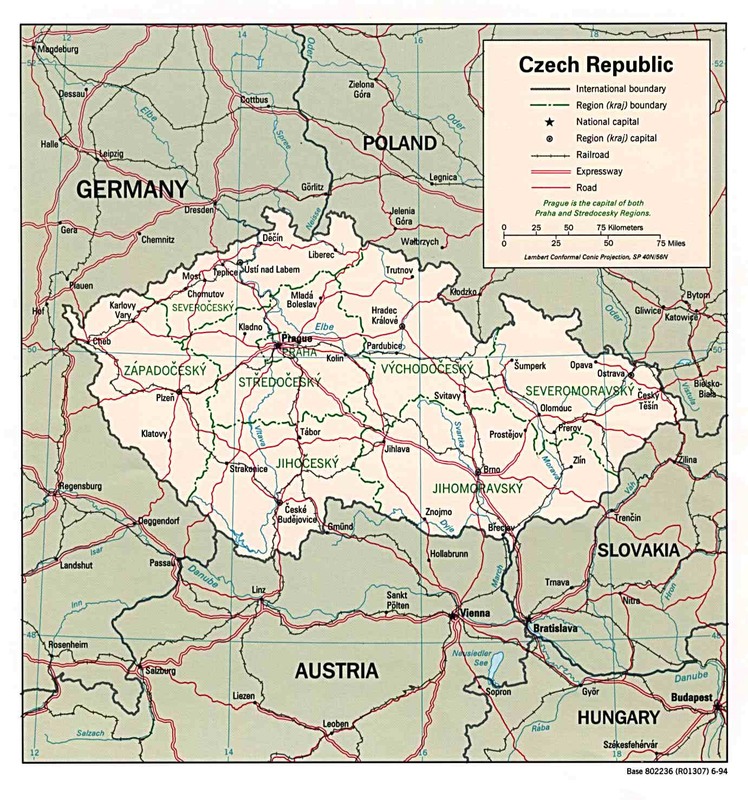 3 Apr 1945 Czechoslovak Republic re-constituted. 8 May 1945 Prague liberated. Note: These three "lands" are roughly the territory of the modern Czech Republic and were called the "Lands of the Crown of St. Wenceslas," over which the ruler of Austria (1527 to 1867 a purely dynastic, rather than territorial, title) ruled in his capacity as king of Bohemia and, margrave of Moravia, and duke of Upper and Lower Silesia. c.570 - 806 Under Avar rule. historically documented Přemyslid duke was Bořivoj I from c.867. 806 - 849 Under Frankish (Bavarian) suzerainty (tributary by force, renewed 845). c.867 - 1. Jul 895 Under Moravian suzerainty (recognized by Germany 2 Mar 890). Mar 1003 - 8 Sep 1004 Polish occupation. 8 Sep 1004 German intervention. Přemyslid dynasty rule)(ratified 8 Sep 1198). Přemyslid dynasty to its kingship. (to 1254, then from 25 Dec 1259) and Carinthia (from 27 Oct 1269). 21 Nov 1276 Austria renounced, Bohemia confirmed by peace treaty (effective 25 Nov 1276). Jun 1290 – 21 Jun 1305 Personal union with Poland. 4 Aug 1306 Přemyslid dynasty extinct. 14 Aug 1308 Austrian claim waived by treaty. 27 Jul 1310 King declared deposed by Imperial court, having been banned by the Pope. 1319 Upper Lusatia (Horní Lužice) acquired (the remainder in 1329). monarchy (to be elective if extinct). as an electoral member of the Holy Roman Empire. 1367 Lower Lusatia (Dolní Lužice), the former March of Lusatia, acquired. 1373 - 20 Mar 1414 Mark Brandenburg part of the "Lands of the Crown of Saint Wenceslas." 25 Oct 1419 Anti-Catholic revolt in Prague, Vyšehrad occupied 13 Oct 1419 - 23 Apr 1420. 21 Feb 1420 Tábor founded by Hussite rebels. 30 Jun 1420 - 28 Jul 1420 First crusade called for by the Pope against Hussite heretics. 24 Aug 1421 - 2 Oct 1421 Second crusade launched. 13 Oct 1422 - 8 Nov 1422 Third crusade launched. 1 Sep 1452 Tábor occupied, civil war terminated. 23 Dec 1466 King banned by the Pope resulting in civil war. and parts of Silesia, Mátyás keeps Moravia and Silesia. 7 Dec 1478 Unity restored by peace treaty (ratified 21 Jul 1479). 9 Aug 1490 - 29 Aug 1526 In personal union with Hungary. 24 Feb 1527 Under the Habsburg dynasty of Austria. 19 Aug 1619 Habsburg king is declared deposed. 4 Nov 1619 - 10 Nov 1620 Friedrich V Elector of Palatinate, is elected Bohemian king. 10 Nov 1620 Habsburg (from 29 Nov 1780, Habsburg-Lothringen) rule restored. 15 May 1627 Absolute hereditary monarchy, parliament loses legislative powers. Lusatia are ceded to Saxony. constituent parts of the Empire of Austria (Kaisertum Österreich). 1 Jan 1850 Bohemia a separate Austrian crownland (Königreich Böhmen). 8 Jul 1866 - 18 Sep 1866 Prussian occupation. 28 Oct 1918 Part of the Czechoslovak State (effective 29 Oct 1918). Kníže český; (in German): Herzög der Böhmen ("Duke of the Bohemians"). (b) 1527 - 29 Oct 1918: König von Böhmen/Král český ("King of Bohemia") as part of the typical long form of the Habsburg (from 1780, Habsburg-Lothringen) dynasty including effective and titular titles (see under Austria). .... - c.400 Quadi rule. c.400 - 454 Ruled by the Huns. 454 - c.508 Herulian rule. c.508 - c.568 Lombard (Langobard) rule. c.568 - c.792 Avar rule. 870 - 871 Frankish occupation. 871 - 906 Independence (Kingdom of Moravia). 906 - c.956 Hungarian rule. c.956 - 8 Sep 1004 Bohemian (Czech) rule. 8 Sep 1004 - 1029 German intervention in Bohemia, Moravia remains with Poland. 1029 - May? 1034 Bohemian rule, administration by royal son (Břetislav I). May? 1034 - 10 Jan 1055 Bohemian direct rule. 10 Jan 1055 - Jul? 1055 Seniorate, others get parts of Moravia. Jul? 1055 - 1058 Bohemian rule. 1058 - Feb? 1061 Vratislav I restored. and Znojmo (Znaim). Each ruler was styled "Prince of Moravia." Jul 1099 - 25 Dec 1000 Bohemian occupation of Brno and Znojmo. 16 Jul 1110 - Dec 1113 Ota II "Černý" imprisoned. Mar 1123 Soběslav I deposed by force. 18 Feb 1126 - Sep 1126 Olomouc reverts to Bohemia. Nov? 1128 - Sep? 1130 Brno and Znojmo (to 1134) revert to Bohemia. 1 Mar 1130 - Oct? 1135 Olomouc reverts to Bohemia. 1134 - 13 Dec? 1160 Konrád II restored in Znojmo. Oct? 1135 - 1137 Olomouc given to Lupold. Apr? 1146 Bohemia occupies Znojmo (Znaim). 16 Aug 1156 - Sep 1173 Brno reverts to Bohemia. 12 May 1160 - Sep 1173 Olomouc reverts to Bohemia. 13 Dec? 1160 - Sep 1173 Znojmo reverts to Bohemia. 15 Jun 1189 - 6 Dec 1197 Under Bohemian administration. 16 Oct 1239 - Apr 1246 Under Bohemian administration. 26 Aug 1278 - 1 Jan 1334 Under Bohemian administration. 17 Sep 1309 Pledged to Austria (voided 30 Mar 1310 by treaty). 1 Jan 1334 Given to royal son. 26 Dec 1349 Moravia given to brother as a Bohemian fief. 18 Jan 1411 - 3 Oct 1423 Reverts to Bohemia (according to 21 Mar 1371 will). 15 Jun 1438 Austrian rule also in Bohemia. Lusatia and parts of Silesia, Mátyás retains Moravia and Silesia. 21 Jul 1479 Unity restored (by peace treaty signed 7 Dec 1478), under Bohemia. 1 Jan 1850 Moravia a separate Austrian crownland (Markgrafschaft Mähren). 15 Nov 1860 - 29 Mar 1861 Administrative union of (Austrian) Silesia with Moravia. 12 Jul 1866 - Sep 1866 Prussian occupation. 21 Dec 1867 Part of the "Austrian" half of the Austro-Hungarian Monarchy. 29 Oct 1918 Moravia handed over to Czechoslovak authorities. (e) 1527 - 29 Oct 1918: Markgraf zu Mähren ("Margrave of Moravia") as part of the typical long form of the Habsburg (from 1780 Habsburg-Lothringen) dynasty including effective and titular titles (see under Austria). "Duke of Silesia, Lord of X" [where X is residence]). 9 Apr 1241 Wrocław is destroyed by the Mongols. 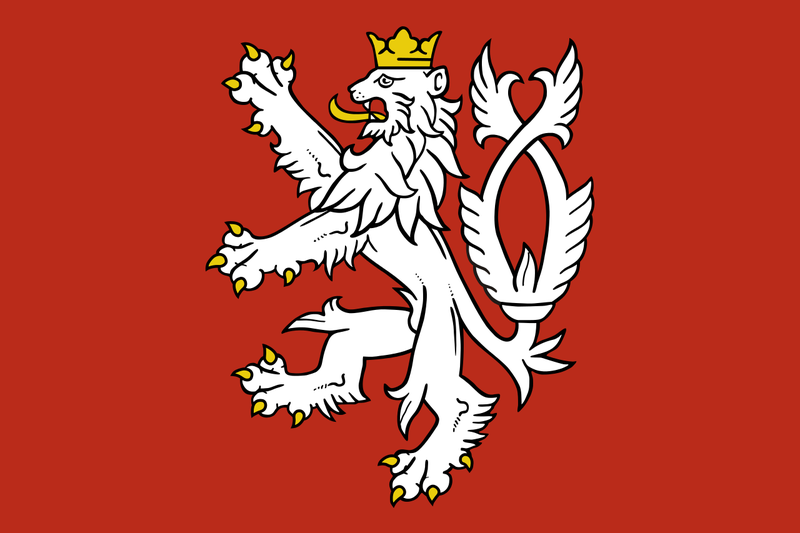 Poland by the Treaty of Trentschin (Trenčín)(ratified by Poland 9 Feb 1339). branches of the Polish royal family. 21 Jul 1479 Unity restored under Bohemia (by peace treaty signed 7 Dec 1478). 21 Nov 1675 Remaining Piast dynastic territory, Legnica/Liegnitz, reverts to Bohemia. 16 Dec 1740 Prussian invasion begins. Treaty of Dresden on 25 Dec 1745 and Treaty of Hubertusburg on 15 Feb 1763). 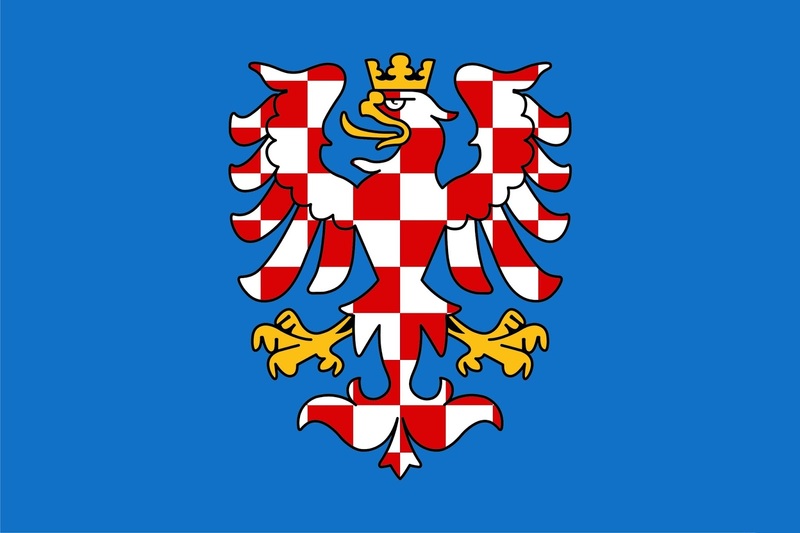 1 Jul 1782 - 31 Dec 1849 Amalgamated with Moravia (fully from 15 Mar 1783). 15 Nov 1860 - 29 Mar 1861 Amalgamated with Moravia. 5 Jul 1866 - Sep 1866 Prussian occupation (see under Moravia). 30 Oct 1918 - 18 Dec 1918 Part of the Sudetenland province of German Austria. 18 Dec 1918 Opava (Troppau) taken over by Czech authorities. final delimitation completed 16 Mar 1923). (ZNV) established at Ostrava, Moravia. which is voided by the ZNV on 12 Jan 1919. 25 Nov 1918 RNKC authorized to act as local representative of Polish government by Poland. 23 Jan 1919 Czechoslovak invasion begins. 26 Jan 1919 Polish forces evacuated, RNKC relocated to Kraków. 27 Jan 1919 - 27 Feb 1919 Czechoslovak occupation of Teschen. 27 Feb 1919 Polish control over Teschen restored (by agreement of 25 Feb 1919). the region to hold a plebiscite (which is ultimately cancelled). 4 Aug 1920 RNKC self-dissolved. Ambassadors decision of 28 Jul 1920. 31 Mar 1921 Polish part integrated into Polish Silesia. 2 Oct 1938 - 25 Oct 1939 Part of Teschen (in Polish called Zaolzie) annexed by Poland. 16 Mar 1939 Annexed by Germany as the Protectorate of Bohemia and Moravia. 29 Mar 1990 Czechoslovak Federal Republic (in Slovak: Czecho-Slovak Federal Republic). 1 Jan 1993 Separation into Czech Republic and Slovak Republic. International Disputes (1948-1992): Liechtenstein's royal family claimed restitution for 1,600 sq km of land in the Czechoslovakia confiscated in 1939; individual Sudeten Germans sought restitution for property confiscated in connection with their expulsion after World War II; Austria had a minor dispute over the Temelín Nuclear Power Plant. 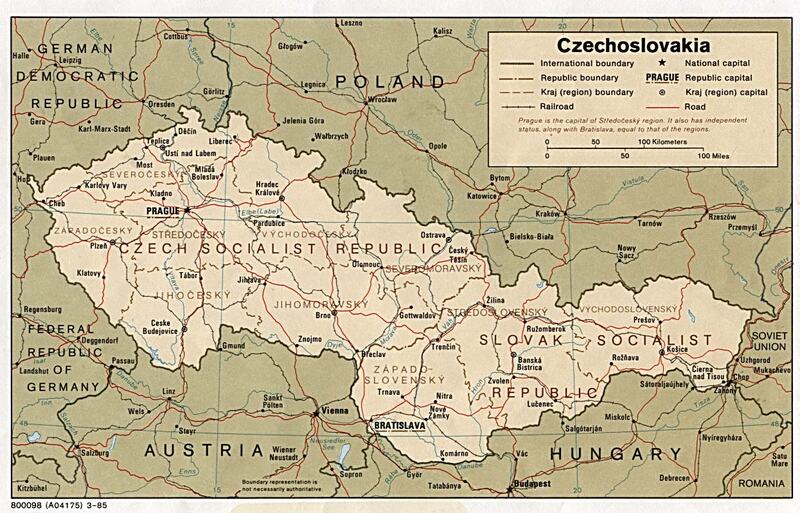 1 Jan 1969 Czech Socialist Republic (within Czechoslovakia). 6 Mar 1990 Czech Republic (Czechia)(within Czechoslovakia). 1 Jan 1993 Czech Republic independent. International Disputes: While threats of international legal action never materialized in 2007, 915,220 Austrians, with the support of the popular Freedom Party, signed a petition in Jan. 2008, demanding that Austria block the Czech Republic's accession to the EU unless Prague closes its controversial Soviet-style nuclear plant in Temelín, bordering Austria. 15 Mar 1935 German occupation begins. 8 May 1945 End of German occupation. 11 May 1945 Czech government arrives in Prague. (see below); not recognized by Czechoslovakia or the Allies. Nov/Dec 1918 Incorporated into Czechoslovakia. 1 May 1939 Reichsgau Sudetenland created. 4 May 1945 Re-incorporated into Czechoslovakia. province of Oberösterreich, but is not effected. 29 Nov 1918 Krumau (Český Krumlov) taken over by Czech authorities. a province of the German Austrian State, effected 1 Nov 1918. 16 Dec 1918 Reichenberg (Liberec) and Eger (Cheb) taken over by Czech authorities. proclaimed a province of the German Austrian State. 18 Dec 1918 Troppau (Opava) town taken over by Czech authorities. 16 Dec 1918 Znaim (Znojmo) taken over by Czech authorities. ¹German enclaves in the interior (like Brünn [Brno], Iglau [Jihlava] and Olmütz [Olomouc]) also proclaimed their union with German Austria, but were immediately occupied by Czech authorities.